Immersion is a replacement for the dated quest & gossip frames. Hugely inspired by the talking head frame, Immersion is a no-nonsense solution to the wall of quest text you never read, without hindering your progress. Skip ahead, accept quests and select dialogue options with the press of a single button or simply click anywhere on the frame to pick up the next quest. All your hotkeys are customizable and you can even use number keys to press specific gossip/quest options. Even though you can navigate the interface much faster than the regular quest & gossip frames, Immersion will get you to actually read and understand what's happening on your questing adventure, without any cumbersome stops along the way. Unlike other replacements for quest & gossip, Immersion doesn't take the long route and force you through menus and text. The full immersive experience is there for you when you want it, but doesn't get in your way when you're in a hurry. When i try and place the Model / Text box near my character it seems to not allow me to, is this by design ? or is there possibly something else such as another addon blocking me from placing it there? Basically when i try to place it around or near my character the box just moves to either the left of right, very weird. I have this issue even with Immersion as the only addon enabled. I always have to toss it around the screen and hope it'll land somewhere near the middle. Very frustrating, not entirely sure why it's happening, but surely it's not intended. My primary wish is to add an option to make the Quest Objectives frame free-movable like the Gossip frames are. That way the Dialogue frame stays where it is instead of getting pushed up, blocking view of center screen. And, if possible, to have the option to set the width size of the Quest Objectives; so that fits a certain portion of my screen and is only able to scale upward. I don't know the first thing that comes to creating addons for WoW, so I apologize if this a big ask. 2nd suggestion would be to add an option to have Gossip frames cascade upwards. Not a super big deal if added or not. I'm not entirely sure how it would look when talking to guards since they have a lot of gossip options. But to have this option in the settings would be a nice touch. Anyways, thank you for the wonderful addon! I look forward to seeing what you make next! Not a bad idea, I'll consider it. A feature I'd really like to see added is integration with Grail that shows the user if the quest they are about to accept has incomplete breadcrumbs. I imagine a red asterisk next to or in place of the quest icon in the top-right corner and possibly a tooltip that displays on rollover. It saved me from accepting the Felwood quest "The Ruins of Kel'Theril" which would have locked me out of some easy Timbermaw rep. It's a little sloppy, but I have no idea how to make it display as in my original comment. I'm having an issue with moving the gossip frames, even after having both boxes unchecked in general options. My frame lock is unchecked, yet the gossip box is still at the bottom of my screen, covering my bartender action buttons which is very annoying. 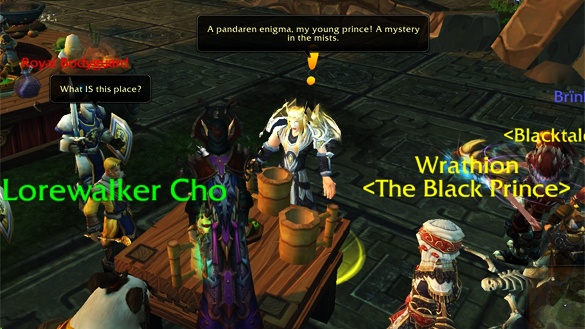 Maybe this is just how the gossip box is while doing my artifact quests? Maybe it's Legion that is the problem, when flying into a new zone and all that jazz. Unable to move the box for these artifact/new zone in quests. Strange, oh well. 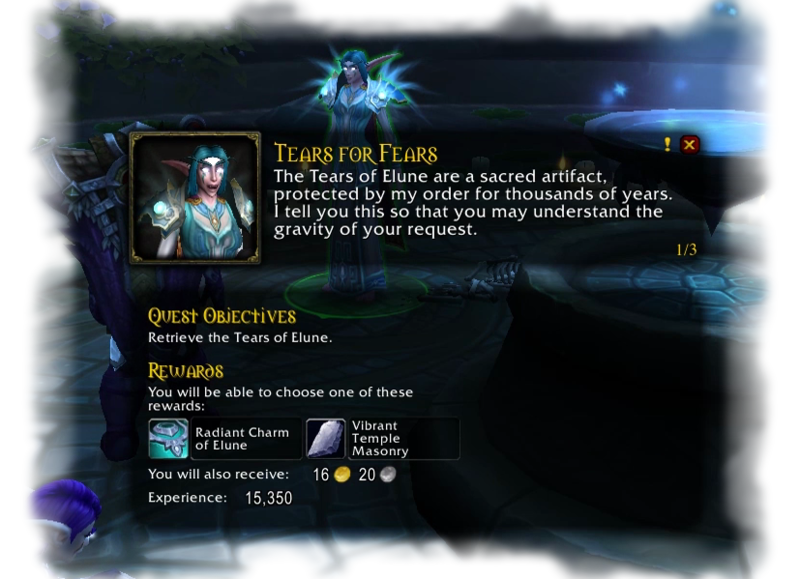 So after further testing, it appears that quest text box is movable, but the hard coded stuff like artifact quests and raid text and all that stuff is NOT movable. Wonder if there will ever be a fix for that? You're talking about the regular talking head frame. It looks almost identical to Immersion, so I can understand the confusion. There's an option in the settings to position it in the same position as Immersion. Quick question: does this addon interact with the talking head frame in any way? Changing the location or otherwise? With the addon installed it seems to make the talking head frame location inconsistent, sometimes anchored to where I intended, and sometimes anchored to the bottom of the screen. Top one where I don't want it, bottom where I do. I have the addon set so that the talking head frame and the immersion frame are stacked. It changes the location of the talking head if that option is enabled, but it doesn't prevent other things from also moving the frame. The addon is overall excellent, but a problem I noticed is that whenever an NPC mentions Venture Co., it cuts off the rest of the text like it's another sentence, since Venture Co. has a period at the end. If it's possible to fix this, it'd be great. Figure out a way that doesn't entail putting "Venture Co." in the code, and I'll do it. This can happen with letters and other things too, but it's somewhat rare, and hard to code a solution that works in every language without putting all those odd cases in a database. So, Elvui changes the font and size of this addon and doesn't have any options to change it. Not even shadow & light add any for this. Addons like Storyline don't change it tho. The animation of the NPC is on the text, and it does not let me read with clarity what it says, it's on a private server, how can I solve this problem? Absolutely love this addon and it's a must have for me. Great work you have here, with this addon. I've been using it for the past 3 months. One thing i want to ask you, is it possible to integrate in immersion addon the text from when a npc is talking with another npc? or when a npc is talking to you about something. Right now it appears as a text bubble on the top of the npc, but i i have my character facing the wrong position, i may only read the text in chat. Thank you.